After the death of his father, the artist moved to Amsterdam, where he joined Rembrandt’s school of art, in the middle of the Golden Age of Dutch painting. In addition to his skill for the painting of interiors, Van Hoogstraten was very interested in art theory, especially in the writings of Leon Battista Alberti, one of the first art theorist of the Renaissance. Such was his interest that he even will write his own theoretical treatise. His paintings will be based almost exclusively on the laws of perspective. 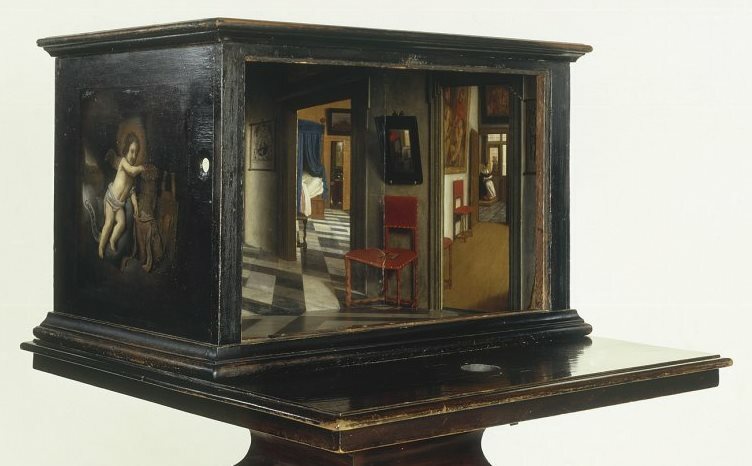 In his city, he was known for his peepshows, rectangular wooden boxes painted inside according the anamorphic perspective where, through a lens, one could see a three-dimensional image, for example, the interior of a house. A view down a corridor is a canvas the artist painted while he was living in England. The painting takes literally Alberti’s principle which states that works of art should be as convincing as if they were seen through a window. The point of view and the amount of details, confirm that the artist took very seriously Alberti’s ideas. In the scene, we see the main corridor of the house of Samuel Pepys, a British official, close friend of Van Hoogstraten. The corridor is long and the arches divide three rooms of the house. The elements placed in the foreground (like the broom and the dog), the floor with black and white tiles and the mirror’s reflection in the second room, increase the illusion of three-dimension and the feeling of depth. Currently, this work is hanged at the end of a corridor in the Museum of Dyrham Park, England. ~ by Álvaro Mazzino on April 19, 2013. Luckily enough, the calling of God is irrevocable (Romans 11:29). The available geeks will run along the right side and will be ranked according to their various (6) category scores. Weekly salary can be anywhere from $300 to a sizeable $2000. that I’m totally overwhelmed .. Any recommendations? Appreciate it! time to browse it all at the minute but I have saved it and also added your RSS feeds, so when I have time I will be back to read a lot more, Please do keep up the excellent jo. This entry was posted on April 19, 2013 at 09:16 and is filed under Baroque.You can follow any responses to this entry through the RSS 2.0 feed.You can leave a response, or trackback from your own site.